BMW's pop-up store in an upscale Costa Mesa, Calif., mall: Neon lights, big flat screens, museum artwork, a merchandise boutique and a BMW car. "In some ways, we — and not just BMW — need to catch up with our whole environment." Late last year, BMW of North America opened a pop-up store in a California mall occupied by high-end retailers -- its first temporary store in the United States. BMW did it quietly, without the usual national fanfare over a new program. 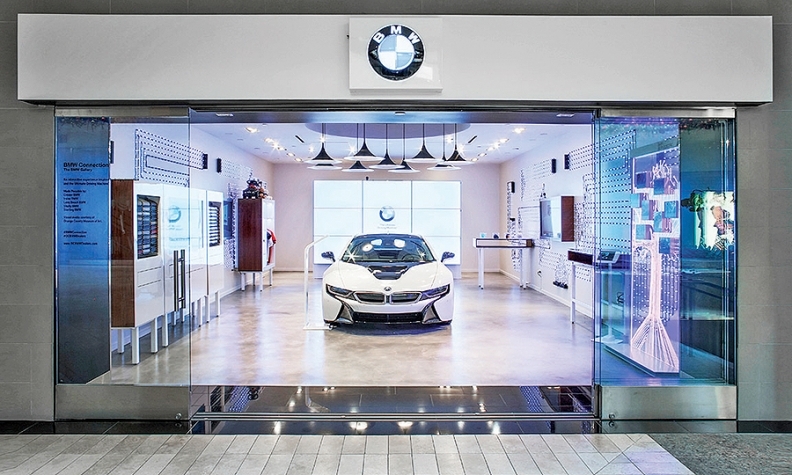 For four months, the BMW Gallery in the South Coast Plaza mall in Costa Mesa showcased a car -- initially the i8 plug-in hybrid sports car -- in an eye-popping environment featuring neon lights, large flat screens for configuring cars, art from a local museum and a merchandise boutique. 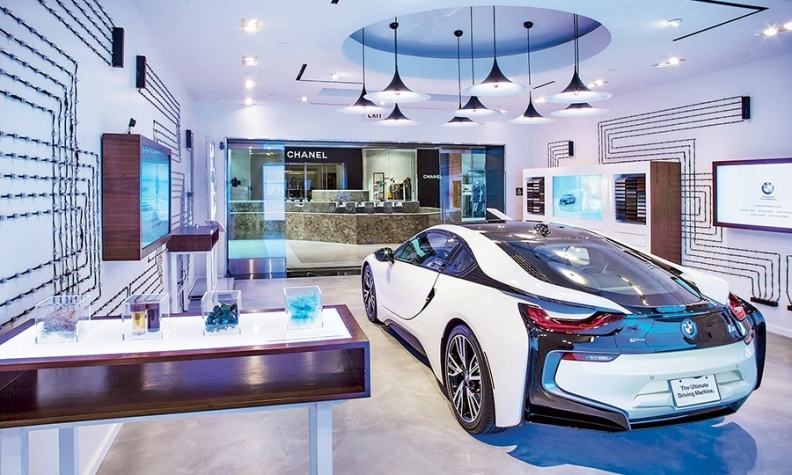 A few years ago, a pop-up store would have been unthinkable for a luxury titan such as BMW. But BMW is facing new competition, including Tesla stores sprouting in numerous malls. And it wants to lure customers back to stores and away from online shopping sites. Pop-ups are part of a year-old global BMW initiative called Future Retail that emphasizes digital tools and clean, cool environments like those of Apple stores. BMW wants all of its 339 U.S. dealers on the program by 2019. This year, Ludwig Willisch, CEO of BMW of North America, said the program will cost dealers about $500 million total. The Costa Mesa pop-up offered a peek into how it all could work. Car sales weren't permitted, but visitors could register with one of five participating local dealerships for a test drive. On its peak day, 2,400 people went through the store, said Peter Miles, vice president of sales channel development and customer relations. In total, more than 100,000 people visited the pop-up store. BMW isn't alone with its Geniuses. Luxury brands are in a race to cater to customers. Here are some examples. • Lexus has set up delivery and technology specialists at dealerships. • Each Cadillac dealership must designate 1 employee as a technology expert who handles anything to do with the Cadillac User Experience system or connectivity. • Mercedes-Benz wants to train 1,600 product concierge specialists by year end. 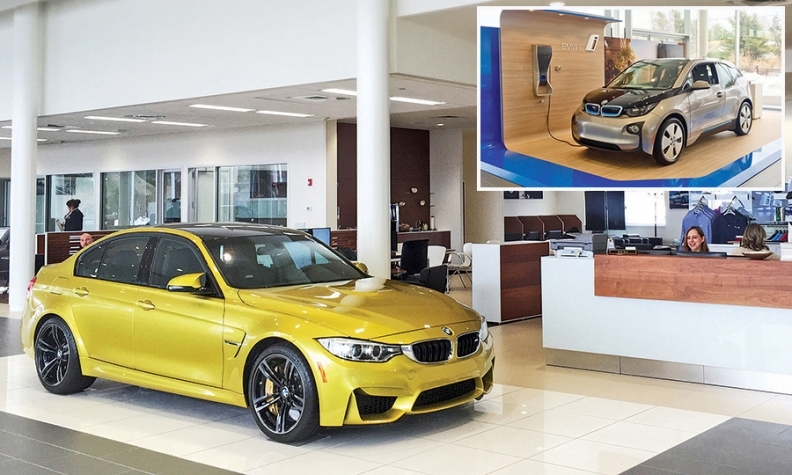 BMW of Cape Cod's reception area, and I3 display (inset), are part of the $10 million store opened by Joe Laham in August. The dealership was built to BMW's Future Retail specifications. Steve Rudkin, general manager of Irvine BMW in Irvine, Calif. -- one of the first stores that participated -- said the pop-up helped his store set November and December sales records: "I really believe we get the brand in front of people that are not looking to go to a BMW store in the near future." The pop-up housed a special-edition 5-series sedan during the Black Friday weekend in November, and "we sold 20-plus -- we sold out of that car," Rudkin said. "It was a great result and had a great impact on our business here." Miles sees it as a way to give potential customers "a gateway, an impression [of] the brand and an invitation to have a test drive at the convenience of their home." The five dealerships will be involved in another pop-up store in the same mall in June, in a space that will house more than one car. BMW's Future Retail program "is the umbrella of the facility, people and processes change," said Miles, who heads a new team focusing on customer experience. Future Retail is a response to lead generators that have gotten in between dealers and customers, he said. "We are on a mission to earn back our customers from third parties that sell us leads because we lost the trust and the transparency of our customers -- that is why the digital environment has been so successful over the last 20 years," Miles said. Miles wants the revamped dealerships, programs and apps to offer customers an opportunity to "learn, try and buy." Dealers say it's important to get buyers back into the stores to configure cars. Rudkin said traffic in his store is down compared with previous years because more shoppers research cars on the Internet. But once customers are in his store, Rudkin said, the dealership has a closing rate of about 50 percent: "One facet of Future Retail is to bring people into these buildings and to have them spend some time here and enjoy that car-buying experience again." John Desmond, market area vice president for 12 luxury dealerships owned by the Charlotte, N.C.-based Hendrick Automotive Group -- including three BMW stores -- said BMW's program addresses a new reality. "In today's world, we are not just operating in the automotive retail space; we are being benchmarked and compared to the Ritz-Carlton, Four Seasons and other luxury retailers," Desmond said about luxury carmakers. "In some ways, we -- and not just BMW -- need to catch up with our whole environment." Miles said Desmond is part of a recently formed committee of eight of "our most innovative dealers" who "are specifically charged with working with us to look at what we need to do differently." A year into Future Retail, 22 dealerships have been updated or rebuilt, and 147 letters of intent have been signed. Construction will continue during the next three years, BMW executives said. The store design was influenced by the work of the late modernist German architect Ludwig Mies van der Rohe with an emphasis on open space, lots of glass and natural light. The new look includes a clean, white exterior, with a focus on the showroom display of cars called the "driving gallery," according to a company description. Pop-up stores, says BMW's Peter Miles, can provide consumers "a gateway" to the brand. The showroom is open and free-flowing. Large, virtual display screens are required. "We can control up to eight channels of what goes on that screen, whether it is a marketing message, a new car, or if we want to advertise a specific model," said Greg Marks, head of BMW's center development. Joe Laham, owner of BMW of Cape Cod in Hyannis, Mass., opened his $10 million dealership, built to Future Retail specifications, in August. 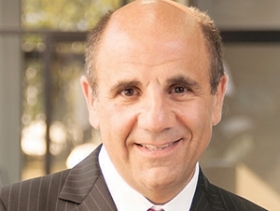 Laham said he expects his annual new-vehicle sales to jump to 500 this year. The previous franchisee sold 90 vehicles a year, Laham said. BMW dealers are required to install an Isetta Bar -- the name harks back to the tiny bubble car BMW sold in the 1950s. Laham said he serves fruit-infused water and changes the flavor every day. The air in the dealership carries the Asian Gardens scent, the same scent used at the Encore Hotel in Las Vegas, Laham said. Laham said the overall ambiance of his dealership is "immaculate -- they have to feel like they are walking into a luxury hotel." BMW wants to enhance that feeling with programs, such as customer vehicle pickup and delivery, and an effort to get the total sales process down from about 41/2 hours to one. It has run about 3,000 senior dealership leaders through its Modern Luxury training program. Desmond, of the Hendrick group, said pop-ups and the Future Retail program are the kinds of steps dealers must take: "We want to create this environment where it's not the old school: You come in the door and get attacked by five people."